Socrates Theodossiou is the CEO of Tototheo Maritime. He began his professional career with Tototheo Maritime shortly after his studies in 2001. He holds a Bachelor Degree in Business Administration and a Master's Degree in Marketing Management. During his career, he was trained and certified by leading manufacturers in bridge equipment and services on-board thus having a broad technical knowledge in navigation, safety, IT and satellite communications. He was subsequently certified to train and approve other engineers to carry out onboard services. He is an active member of the maritime community, being the chairman of the Cyprus Shipping Chamber's E-navigation working group. Socrates is a member of the PortCDM International Council and a partner of the Cyprus University of Technology (CUT) for research, development and testing of new technologies. He participates in the biggest e-navigation testbed globally, Sea Traffic Management (STM) which started in 2013 and will end in 2018. 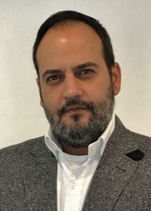 Socrates' motivation is his passion for new technologies within the maritime sector and mobile satellite communications. He recently founded MarineFields, a company that specializes in the Connected Ship, Ports and People concept with the latest project being the development of port collaboration decision making services.